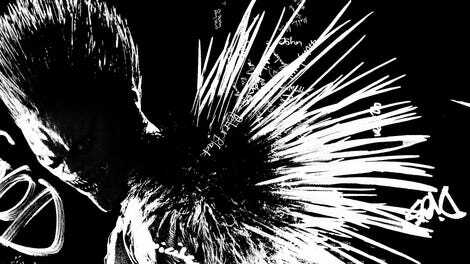 It’s unclear who the intended audience might be for Death Note, Adam Wingard’s fitful adaptation of the cult manga and anime series of the same title. The premise: A moody Seattle high-schooler (Nat Wolff) gets hold of a supernatural book that grants him the ability to kill anyone he wishes in gruesome, brain-splattering, Final Destination-esque fashion with the help of a chisel-toothed, bug-eyed, quill-covered nether-being (Willem Dafoe) that only he can see; said moody Seattle high-schooler shares his newfound power with a love interest (Margaret Qualley); they kill hundreds of gangsters and terrorists and become horny, death-dealing fascist demi-gods; a world-famous masked detective (Lakeith Stanfield) who eats only candy and squats on chairs instead of sitting enters the picture. Probably the right director for this super-weird material would be Takashi Miike or maybe Richard Kelly; in fact, there’s more than a touch of Kelly’s Donnie Darko to the film. But Wingard, the protean, gore-hungry director behind You’re Next and The Guest, seems as confused by the cartoonish and nihilistic plot as anyone else. The result is perversely watchable, which puts it a cut above the average inane wannabe franchise-starter. With no likable characters or internal suspense to keep it in check, Wingard’s direction sputters out into a cloud of slickness and pastiche: chases set to Giorgio Moroder-type beats; eccentrically purposed pop songs (Australian Crawl’s “Reckless,” the Air Supply version of “The Power Of Love,” etc. ); teen-movie stock characters; a certain famous Blade Runner prop; an homage to Jonathan Demme. Just in case anyone thought that Wingard had forgotten about John Carpenter, the end credits roll out in the genre master’s favorite typeface, Albertus. But as for Wolff’s Light Turner—that is, the ostensible focus of the film—he’s afforded about as much sympathy as the protagonist of a Tales From The Crypt episode. A slow-motion sequence of FBI agents belly-flopping off an office building The Happening-style gets as much attention as our young antihero’s moral compass. And when it comes to the twisted relationship dynamic between Light and his girlfriend, Mia (Qualley), it’s strictly for the montages. The tyrannical teen-angst power fantasies, the eroticized thrill-killing, the Faustian bargain with Dafoe’s raspy demon, the relationship between Light and his pompadoured cop dad (Shea Whigham)—without an element of viewer identification, even the sickening kind, these become little more than surreal trimmings or excuses for Wingard to order up more blown-out neon lighting from his old-hand cinematographer, David Tattersall (Con Air, Speed Racer). It takes less than 10 minutes for Light to transform from a term-paper-selling loser who lives so close to the train tracks that his dishes rumble off the dinner table into a remorseless Angel-Of-Death-in-training. For a time, Death Note’s speedy amorality holds interest, but its witlessness becomes more obvious as it bears on. One can’t help but chalk up some deficiencies to the absence of Simon Barrett, Wingard’s regular screenwriter; Death Note, which cost about four times as much as all of Wingard’s previous movies combined, is also the first feature he’s made without Barrett since his early days as a no-budget splatter director in Alabama. The only human presence that seems to satisfy Wingard’s visual preoccupations is Stanfield’s monogrammatic, black-clad super-sleuth L. It’s a truly kooky performance that finds the gifted comic actor contorting his gaunt frame to approximate the choppy movement of an animated character. In a sequence that finds him pursuing Light on foot, he performs the least convincingly human sprint this side of Tom Cruise. One might say it’s almost worth the price of admission, but Death Note is a Netflix exclusive.